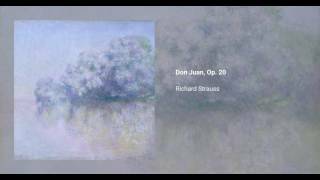 Richard Strauss wrote his tone poem for large orchestra Don Juan in 1888, and it premiered the following year, representing a breakthrough for the composer, who was only twenty four years old when he wrote it. He based his work on a retelling of the Don Juan legend by pote Nikolaus Lenau. A typical performance of the tone poem takes around sixteen minutes, and the difficulty of the instrumental parts makes it a common source of audition pieces for many instruments. It is scored for 3 flutes (3rd doubling piccolo), 2 oboes, English horn, 2 clarinets in A, 2 bassoons, contrabassoon, 4 horns in E, 3 trumpets in E, 3 trombones, tuba, timpani, triangle, cymbals, glockenspiel, harp and strings.